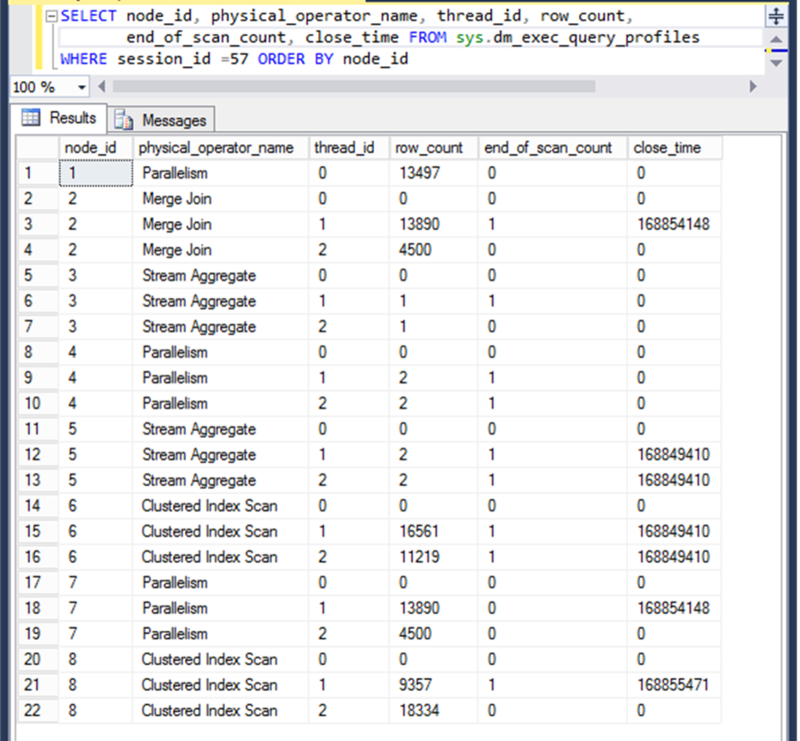 SQL Server keeps track of how many inserts and deletes since last stats update – when the number of inserts/deletes exceeds the stats update threshold the next time a query requests those stats it’ll qualify for an update. Trace flag 2371 alters the threshold function before SQL Server 2016. With 2016 compatibility mode, the T2371 function becomes default behavior. Auto-stats update and auto-stats update async settings of the database determine what happens once the stats qualify for an update. But whether an auto-stats update or a manual stats update, the density, histogram, etc are all updated. Trace flags 2389, 2390, 4139, and the ENABLE_HIST_AMENDMENT_FOR_ASC_KEYS hint operate outside the full stats framework, bringing in the quickstats update. They have slightly different scope in terms of which stats qualify for quickstats updates – but in each case its *only* stats for indexes, not stats for non-indexed columns that can qualify. After 3 consecutive stats updates on an index, SQL Server “brands” the stats type as ascending or static, until then it is branded ‘unknown’. The brand of a stat can be seen by setting trace flag 2388 at the session level and using dbcc show_statistics. T2389 – Introduced in SQL Server 2005 SP1. quickstats update for stats branded ‘ascending’. Finds just the current max value, and density together with max value is used for estimate outside of histogram range. Histogram itself is not persistently amended. 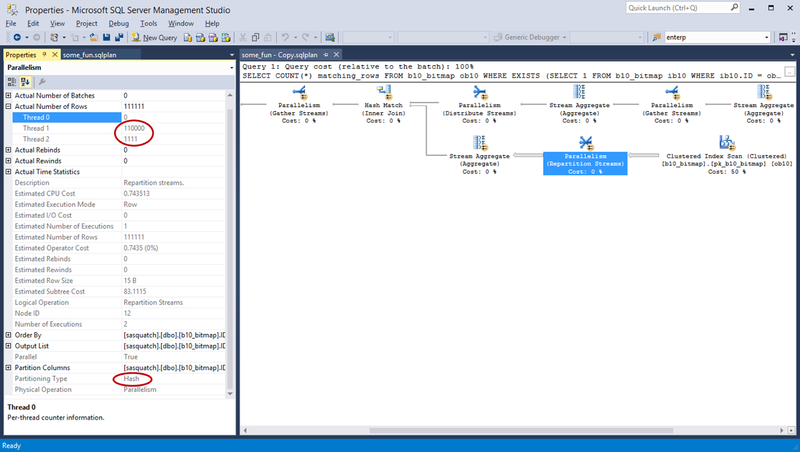 T2390 – Introduced in SQL Server 2005 SP1. quickstats update for stats branded ‘unknown’. Finds current max value for stats branded ‘unknown’, as above. T4139 – First available in SQL Server 2012 & 2014, released in the CU stream for each. A significant gap left with T2389 and T2390 is a case where an index stat has been branded ‘static’ based on its update pattern, even though over the longterm trend the highest value is ascending. In fact, if more than 10% of the edits to an index between stats updates are *within* the histogram range rather than 90%+ above the histogram range, it may be marked as static. So, with trace flag 4139 an index can qualify for a quickstats update regardless of its brand. Trace flag 4139 supersedes and exceeds T2389 & T2390 in that manner. ENABLE_HIST_AMENDMENT_FOR_ASC_KEYS – This hint was introduced in SQL Server 2016 SP1. It functions as trace flag 4139 does, but it can only be applied at the query level while trace flag 4139 can be enabled globally. Wanted to point out that the kb4316948 fix for histogram amendments (quickstats) is now available in SQL Server 2016 CU5 as well as SQL Server 2017 CU8. The Connect item link below is, of course, dead now. No matter. Because this issue was fixed in SQL Server 2017 CU8 by this kb. I was quite happy with the way this particular one worked out, though. It started as a maze... access violations generated on a SQL Server 2016 instance with dozens of databases. The access violation came from an insert query using a synonym - with the underlying table in another database! (I didn't know that was possible - or *ever* desirable - until I saw it in this context.) The AV was occurring during a multi-step data transfer process and it was hard to isolate the data flowing into and out of the two databases in question. But after some finagling, I got the problem repro pretty doggone small. Reproduced the AVs on several CUs of SQL Server 2016 and on SQL Server 2017 RC2. Here's the setup. Two 2-column tables in tempdb. One of those tables with a single row. The other table with 1 row - then stats auto-created - then a second row inserted. After the setup, the offending query is quite simple. Ouch. That looks really painful. An interesting sidenote: in the not-too-distant past, histogram amendments via trace flags 2389, 2390 and/or 4139 seemed to have been exclusively the realm of the legacy cardinality estimater. This Access Violation is a strong indication that is no longer the case. Filed a Connect item for this. Fortunately, the workflow and data involved in this were amenable to a schema change to no longer use a column of type bit - allowed side-stepping this error for now. 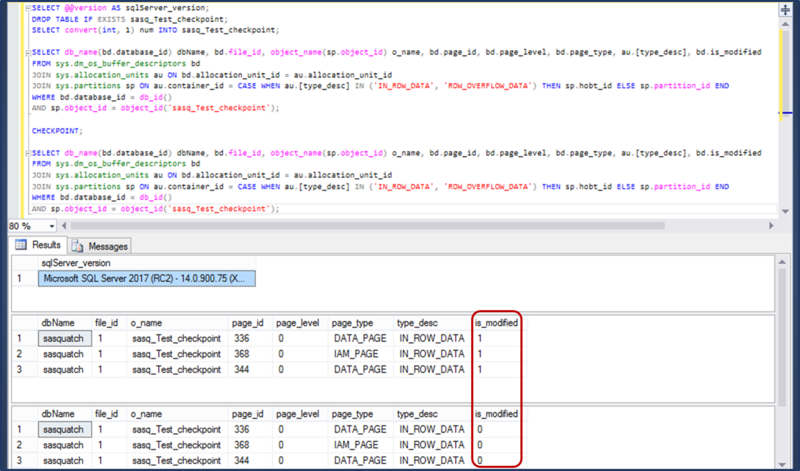 SQL Server - formerly dirty data page still in bpool after checkpoint? @Kevin3NF asked the question, and @NedOtter added the important clarification that my answer is for the context of on-disk rowstore, since Hekaton tables are outside of the bpool thus bpool dirty pages don't apply. A question came up on Twitter #\sqlhelp that caught my eye today. Paraphrasing: After a checkpoint writes a dirty database page, does that page remain in the buffer pool as a clean page? 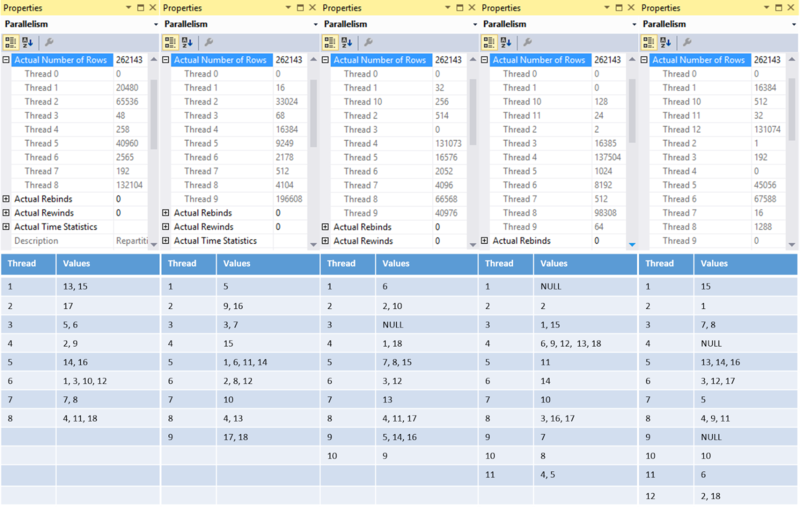 If intrigued by this idea of determining which parallel query thread thread at a given DOP a value or values will be assigned to by hash partitioning, please also see this post by Joe Obbish. The SQL below will create a table with 2^(n-1) rows with num value n, for each integer n between 1 and 16. The total number of rows in the table is 2^15 - 1 or 65535. After Joe's help the code looked like this. Much faster, much nicer. So here's the idea: since each integer value n 1 to 17 is represented in the table with 2^n rows, when rows are distributed to parallel threads by hash the number of rows for the thread will tell me which values went to each thread, too. Later on I thought "hey, I'll save myself some thought if I do this in base 10 rather than base 2." I also wanted to see how Joe Obbish would have approached creating this type of table from scratch. I asked, and he taught me a new trick (which I'll likely have to keep coming back to here otherwise I won't remember how it worked). This isn't exactly how Joe did it, but its as close as I get from memory. This query shows how it works. So here's how it comes together to make my table for exploring. That created 111111 rows in 47 seconds. Let's check up on it... how many data pages? 111,111 data pages - good. OK, now let's have some fun. Let's take a look at the spread of rows/pages in that top right clustered index scan. Thread 1 with 55366 rows and thread 2 with 55745. That's a pretty even split of work between the threads. That's what we want out of the storage engine scan - split the work fairly evenly among worker threads. What about the clustered index scan right below it? That's about a 90-10 split. The storage engine parallel page supplier isn't dividing pages up for the threads based on values in the clustered index - neither of the splits show the kind of numbers needed for the distribution to align with my crafty set of data. Figuring out how the parallel page supplier is coming up with sets of pages will take more investigation than this post can afford - since it'll require at least one separate investigation method. I'll have to explore the parallel page supplier more at another time. On to a peek at how rows are being distributed among parallel threads by a hash function. The Repartition Streams operator details indicates using a hash to distribute the rows. Thread 1 handled almost 100 times as many rows as thread 2. Based on the number of rows of this table each thread handled, we can tell that thread 1 handled the rows with values 5 and 6 while thread 2 handled rows with values 1, 2, 3, and 4. Here's what distribution of rows looked like at that operator for each DOP from 2 to 6. I'm intrigued, to say the least. Especially interesting to me is that DOP 5 and DOP 6 each had only 4 threads active. But the 4 active threads had different values going to them at DOP 5 and DOP 6. All right. The role of the fluff was to help explore the parallel page supplier. I won't get anywhere with that tonight, so let's cut the fluff. GTFOH - Get the fluff out of here! 😁 And let's go back to base 2 - it'll allow me to work more values into a given number of rows. Might as well page compress them, too. This got me 262143 rows in 30 seconds. Pretty tiny table, though. There's room for more - this can only get more interesting with more values in the table. But, I'll stick with this for now. Here's the query I'm using. In this case, I'll look at DOP 3 to DOP 12. At DOP 2, the Repartition Streams operator highlighted before isn't present. So for now, just look at DOP 3 to DOP 12. We got a deadzone in SQL Server 2016 SP1 CU4. A small amount of testing on SQL Server 2016 SP1 CU3 indicates the deadzone behavior was introduced in CU4 and not earlier. Rather than re-generate a bunch of stuff I have from CU2 in CU3, though, for the sake of me finally getting something more info about this scenario into the blog-o-sphere, I'll be comparing the behavior of SP1 CU4 to SP1 CU2 here. The deadzone... for hours, four deep sleepers and one nervous waker for a MAXDOP 2 query try to get it out... usually they do. But it can take hours... sometimes days. My current theory as to what is happening: for some reason, the deadlock monitor is prompting the wrong producer at the exchange to spill. That producer wakes up... can't spill... so goes immediately back to sleep. After some indeterminate amount of time, the deadlock monitor finally prompts the right producer to spill - one that *can* spill. It does spill, and then the query progresses. What leads to the change in which thread gets kicked by the deadlock monitor to spill? I don't know... and not sure I can determine that without access to source code. Let's start this adventure the way I started it: by looking at some frustrating behavior on SQL Server 2016 SP1 CU4. Below is the setup, followed by the troubled query. The table created in the setup is as simple as it gets: single column BIGINT, in a clustered index. 13890 zeroes inserted, followed by 13890 ones. Update stats on the clustered index before the first attempt at producing an egregious hang, so every execution is on a level playing field. Trace flag 8649 is used here so cost doesn't prevent a parallel plan. Hint the merge join to get order-preserving exchanges. The same problem occurs at higher DOP than 2... but when investigating a problem with parallel queries, I recommend working with the lowest DOP where the behavior can be reproduced for the sake of simplicity. I've run the setup and the trouble query in a user database with 8 equally-sized data files, and in a single-file master database, with the same results. When the query is fast... its fast. But when its slow, it can take hours to complete. Sometimes days. Here's live query stats from an example - in fact one that's running as I'm typing in this post. As I was running these tests, I made sure that "live query stats" and "include actual plan" were toggled on for my session. So sys.dm_exec_query_profiles info was available for the session. Whew!! That one finally completed. 21 hours, 16 minutes, 10 seconds as reported by SSMS. Lets take a look at that post-execution plan for clues. There's a warning on the Repartition Streams - what's it say? OK, what about the waits recorded by the post-execution plan? Huh. That's a total of only 176 ms of wait time. 4071 ms of CPU time. And 76569190 ms of elapsed time (21h16m9s190ms). That doesn't add up in any way, shape, or form. What does sys.dm_exec_session_wait_stats say? *That* makes more sense. 306270624 ms of CXPACKET wait time. 85h6m30s624ms among the 5 threads that last long enough to be observed. Got two rows for session_id 68 exec_context_id 1 above. Matching the blocking_task_address in those rows to waiting_task_address... ok, exec_context_id 1 is slotted in CXPACKET wait for exec_context_id 3 and 4. That's reasonable. As DOP increases the number of exec_context_id values with multiple rows may also increase. At really high DOP the number of CXPACKET rows can look downright scary :-) But still legit once used to seeing it. Here's the waiting tasks for another parallel query. There are also 2 rows for exec_context_id 4. Hmmm. That seems plausible. They show the same resource_address, show the same blocking_task_address. However... don't be too quick to brush off multiple rows for a given exec_context_id as due to the parallel CXPACKET wait implementation we just discussed. Or to the "not always transactionally consistent" nature of some of the DMVs. Check it out below. The two rows with exec_context_id value 4 have different values for waiting_task_address, and different wait_duration_ms values. They are different tasks, on different workers. They really shouldn't be reported as the same exec_context_id. Does this matter? Well - the presence of these duplicate values for exec_context_id doesn't seem to be an indication of anything nefarious under the hood. But if you try to piece together wait information for parallel queries, things can get confusing if not ready to accommodate this possibility. And monitoring/trending utilities that collect and correlate information from the DMVs can compound the confusion. Sometimes I have to troubleshoot connection issues... or even query performance issues... for various applications. It can be very valuable to mimic the connection settings including MARS and connection pooling. Here's how to do that - code snippets at the end of the post. Here I specifically enabled MARS because its something I'm looking into right now. Can we see the MARS connection from the database server side? Yep. Code snippet for this also at the end of the blog post. OK. Let's be nice and call Dispose. Oops - typo. Try again. $scon.ConnectionString = "Data Source=localhost;Initial Catalog=MASTER;Connection Timeout=15;Integrated Security=true;MultipleActiveResultSets=True;Pooling=False"